Written by Leif Whittaker and published in collaboration with MSR Gear. During a recent ski tour to Table Mountain in the Mount Baker backcountry, three friends and I rescued a lost dog. It was an hour before sunset on a cold December afternoon and there were no other people in sight when we spotted the shorthaired mutt searching for her owners. As the shivering, disoriented animal limped higher up the mountain, away from the parking lot, it became clear that something was wrong. One member of our group, Kirsten, attracted the timid dog with an avocado sandwich. Kirsten phoned the number we found on the dog’s identification tags and was able to get in touch with the owner, who was waiting in the cozy Heather Meadows lodge, about a 30-minute hike from our location. The dog was not able to run through powder because of some bloody cuts on her feet, so Kirsten and I carried her in our arms while skiing. Soon we came to a firm skintrack that was easier on her paws and she was able to run next to us the rest of the way to the ski area boundary, where we met the grateful owner. 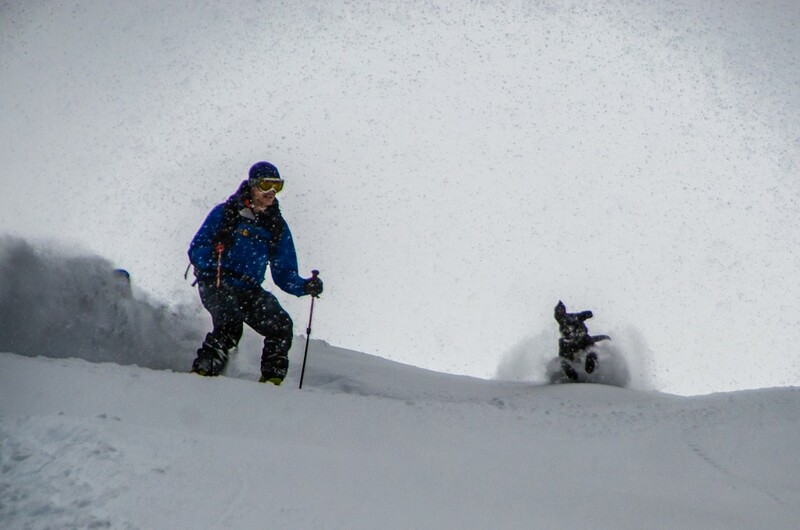 This incident highlights the importance of proper training and dog etiquette in the backcountry. Here are some things to consider before you take your puppy into the snow. First and foremost, make sure your dog is comfortable in cold weather and can travel safely in the snow. Avalanche rescue dogs are commonly larger, furrier breeds like German Shepherds or Golden Retrievers, but that doesn’t mean your Labrador or Blue Heeler should stay home. If you have a small, shorthaired breed think about buying a brightly colored doggy jacket, which has the added benefit of making your dog visible in the snow. Pay special attention to the dog’s paws because soft snow often gets jammed between the pads, causing painful cuts and bruises. Some handlers will even slather Vaseline between their dog’s toes to prevent this problem and others will purchase dog booties made specifically for this purpose. Also, if you are planning an extended tour, remember to feed your dog a bit more water and food than normal. High-protein foods are particularly important because the dog will burn more energy thanks to the cold temperatures and hard work. Generally speaking, backcountry dogs should be obedient and well-mannered around other dogs and people. It is important for the dog to stay within sight of its handler, especially when traveling over complex terrain. If you want your dog to be able to follow you down ski lines, begin training on low-angle slopes without much fresh snow. Go slow and use a long leash to guide the dog behind you. Use treats or special toys to reward good performances and gradually build up to more challenging descents, ditching the leash along the way. Try to avoid busy slopes where the dog might get in the way of other skiers and always keep your dog’s well-being in mind. When traveling in avalanche terrain, remember to consider your own safety and the safety of those around you as well as that of your dog. While you and your ski partners should always be wearing activated avalanche beacons, you should never strap a beacon to your dog. In the case of a burial, a dog with an activated beacon would delay searchers from rescuing buried humans who might have only a few minutes to survive. Remember that it is possible for dogs to trigger avalanches and for that reason you should prevent your dog from crossing slopes that might endanger others. Ski resorts and rescue teams across the world use highly trained avalanche dogs to locate buried victims, often with incredible success. The process of becoming a certified handler-and-dog rescue team can take years. If you’re interested in learning more about this process visit the Canadian Avalanche Rescue Dog Association website (www.carda.ca). All in all, taking your dog into the backcountry can be a rewarding and memorable experience, but please don’t be the like the owner who lost the family pet on Table Mountain. 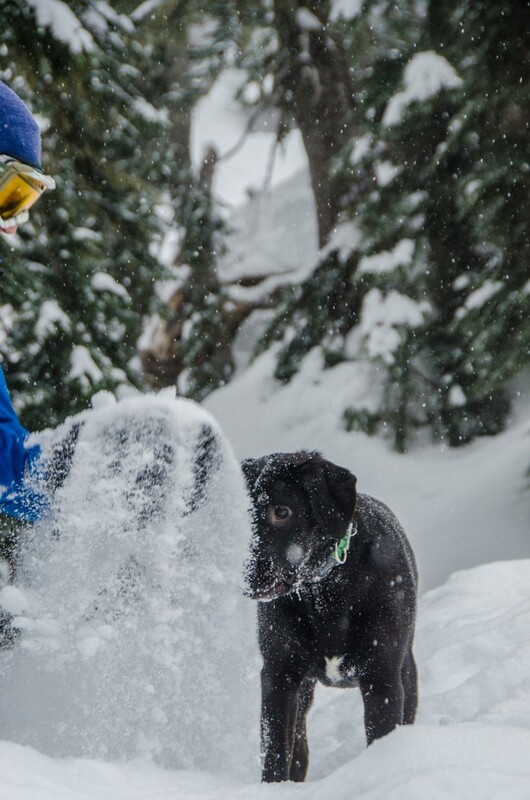 Be a little more thoughtful; your puppy and your ski partners will thank you for it. About the author: Leif Whittaker seeks adventure in all aspects of life. He is a young and accomplished mountaineer who has twice climbed to the summit of Mount Everest. He is also a talented writer and public speaker who inspires others to enjoy the outdoors. His love of skiing, rock climbing, sailing, kayaking, rafting, hiking, photography, and food has led him to explore many remote corners of the planet. He is currently working on a book about his experiences on Mount Everest.